Hawley Lock Supply: NEW: FIC 3 tryout. Fits in older and newer locks. NEW: FIC 3 tryout. Fits in older and newer locks. Fastec has redesigned their newer locks so that the standard FIC1 key will not enter the lock all the way. This set will work on the older and newer styles! 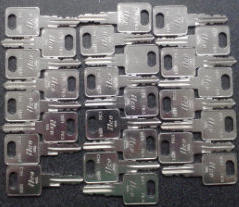 There are 25 double sided keys in the set, for codes EF301-EF351.